Create your unique vocabulary by noodling, testing and saving short musical ideas – riffs of melody, chords or rhythm. Musical vocabulary provides building blocks. 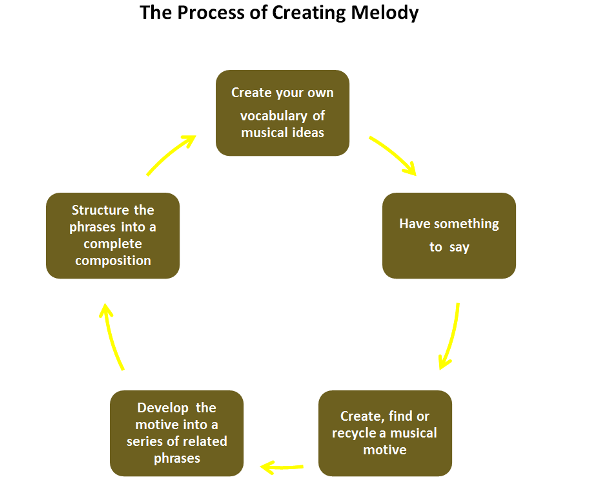 A motive in music is a fragment that can be recognized as the essential characteristic of a composition. A motive will reoccur in a composition. A motive is the shortest expression of a musical idea. A motive is developed into phrases. Phrases are structured to create melodies. There can be no melody without motive. A phrase is the smallest complete music idea. It can stand on its own and make sense to a listener. In traditional and popular music phrases are most often four bars long and end with a clearly recognized harmonic cadence. A phrase may end with either strong or weak cadence. Strong cadences end sections or entire compositions. Weak cadences are generally found within a composition and imply that more is to come. Phrases are built from motives. Think of a phrase as the logical conclusion to what the motive began. A cadence is a melodic or harmonic configuration that creates a sense of either a pause or an end to a phrase, or section of music. Cadence is all about resolution. A harmonic cadence requires at least two chords. Motives are altered in specific ways to create unique but related phrases. Phrases are altered by using the same development techniques to create full compositions.